Let me describe the top “platform.” The idea is that “in order to make best use of the one’s skills, experience, and aspirations, it is valuable to give oneself ample time for connecting, probing, reflecting, and creating” (from earlier post). Equivalently, it is valuable have a space, say, a studio or workshop, as a base from which to advance inner changes and changes in the wider world, and to reflect on the attempts to make those changes. 3. A space where teams work together on a project. 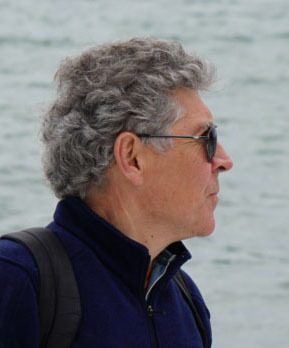 The cycling arrows to the left is learning new knowledge, perspectives, practices, which are more likely to stick—to be remembered, become part of your own cognitive structures or physical capabilities, become part of your own thinking and habits—if practiced in a supportive space and then put into practice in the wider world. In the terms of the previous post, the supportive space is one in which the teacher, coach, or colleague introduces you to new knowledge, perspectives, or practices and encourages you to take yourself seriously in the sense of putting them into practice in the wider world. The cycle to the right is bringing your thinking and habits into engagements in the wider world then taking stock and learning from what happens. You are more likely to learn from what happens if you have time/space/support to do that evaluation, reflection, and revision of plans for future engagements. In the terms of the previous post, the supportive space is one in which the teacher, coach, or colleague encourages you to take yourself seriously in the sense of building a constituency to put your ideas and plans into practice in the wider world. As you learn through the two cycles, you are also improving, extending, or expanding the platform that supports your ongoing development, moreover, your self-directed–not other-directed–development. (The ongoing development is depicted by the opening out lines above the platform.) Conversely, if the platform is small or shaky, then your learning from the two cycles and expansion of the platform might be limited. However, one starts life necessarily with a small platform being highly dependent on others for your cognitive and physical development, indeed for your very sense that you are a self that develops. How do you bootstrap yourself into development? Here my thinking–and the schema above–is influenced by Hendriks-Jansen (1996) and Bowlby, a psychologist who focused on the long term effects of different patterns of attachment of infants and young children to their mothers (Bowlby 1988). Bowlby and others observed what they interpreted as secure versus anxious attachment of young children to caregivers. In a situation of secure attachment the caregiver, usually the mother, is, in the child’s early years, “readily available, sensitive to her child’s signals, and lovingly responsive when [the child] seeks protection and/or comfort and/or assistance” (Bowlby 1988, 167). The child more boldly explores the world, confident that support when needed will be available from others. They have a “secure base.” Anxious attachment, on the other hand, corresponds to inconsistency in, or lack of, supportive responses. The child is anxious in its explorations of the world, which can, in turn, evoke erratic responses from caregivers, and the subsequent attempt by the child to get by without the support of others. In this vein, to the extent that a platform provides a secure base for engagements in the wider world, the child develops in a way that expands that base for further learning through the left and right cycles. This is depicted by the growth from the smaller platform at the bottom to the larger one above. This is an abstract schema, which needs to be filled out with detail about specific knowledge, perspectives, practices, tools and processes for operating studios, and specific engagements in the particular wider worlds you inhabit. In the absence of that, it may be helpful to contrast it to a predominant schema for development. This is the subject of the next post in the series. What if the smaller platform (the secure nurture) was considered the workshop itself –or an intense earlier environment (like CCT for me)? Then you could use the diagram of the larger platform to unfold longer and slower innovative processes as a chance to revisit or unpack them like you are doing yourself by reteaching foundations of Critical Thinking after being away for awhile. Critical thinking in context also needs out of context and “after” context. Got to start work, but was a fun commute of critical thinking this morning! 3. A space where teams work together on a project”. Why did you say ONLY ‘either’…’or’? The practitioner or artist or professional could be focused on one’s creative or generative work, working simultaneously with apprentices on a common project (they are a team). Usually, when we are thinking about something of creative or generative, we are continuously focused on our work, especially during our daily life, because our everyday experience (lived experience) is the first, most important nourishment of our creative or generative work. The daily life offers a series, a variety of stimuli that it is impossible to recreate in a “studio”. It is an artificial environment, also if it is useful in the sense of the previous bullet 1. In my opinion, what is possible to recreate in a studio is a ‘learning space’ in which a team (interpreted as a micro-community or a micro-society, such as classes, professionals etc.) works on a process that, using the creative or generative work of its members, produces something (the outcome) original, valuable, imaginative and accepted by the same team. This also means that people work harmoniously (Plato’s concept). They have different talents and these differences, when put together, strengthen communities or societies (in this case “studios”, if they are considered as “micro-communities or “micro-societies”). In that way, critical thinking is not only viewed as processes-in-context, but embraces the notion of ‘complex thought’. It means ‘learning to live’. It means that everyone has the opportunity to develop not only one’s own distinctness and the bond with others (to understand the complexity of cultural plurality) but also to learn how to afford the numerous uncertainties and difficulties of the human destiny. It means building a new vision starting from a lived experience. In other words, it means putting your ideas and your plans into practice in the wider world with a different consciousness and, at the same time, working on your self-directed–not other-directed–development in the sense of a self-transformation. In this context, habits, perspectives and emotions are fundamental. They could act as mediators and, at the same time, as a motivators. Transdisciplinarity could also contribute. The aim of transdisciplinarity is the unity of knowledge, the human being, the transformation of the self to become agent of social change, to act within society. An example of this is Assistive/Adaptive Technology: transdisciplinary teams of Faculty, students and representatives of the community work together to learn, solve problems and create new possibilities. The members of these particular constituencies come from different disciplines: Mathematics, Business, Engineering, Special Education, Kinesiology, Rehabilitation and Counseling. 1. The practitioner becomes an artist: focusing on one’s creative or generative work the practitioner ceases to be only a practitioner. At the same time, the practitioner is also a professional, feeling clearly the need to apply (pragmatically) his/her skills, experience and aspirations in the wider world. 2. The apprentices are all the members of the “group”. They could be other pratictioners/artists/professionals or apprentices in the strict sense of the word (e.g. students). It does not matter. They are the members of the constituency, thus their different skills, experiences and aspirations are the real added value of the “studio”, the connections-alternatives within the real-wider world. We have multiple identities. It depends on the role that we play in a particular situation. I would like to think that each one is a practitioner/artist/professional (for one’s own creative or generative work) and, at the same time, an apprentice (for the added and different value that the other members of the constituency could add to their own creative or generative work). I agree with the theories of Hendriks-Jansen and Bowlby. I also agree with the idea that a platform provides a base for engagements in the wider world. I have some doubts on the concept of ‘secure’, on the way to interpret it. We could likely consider theories of psychologists along with theories of artists and scientists about the concept of ‘secure’. In my opinion, ‘supportive responses’ mean not only ‘secure attachment’ but also ‘supportive stimuli’ (referring to the development of the self). Sometimes ‘secure attachment’ without ‘supportive stimuli’ could become imitation, acquiescence, dependence and homogenization. 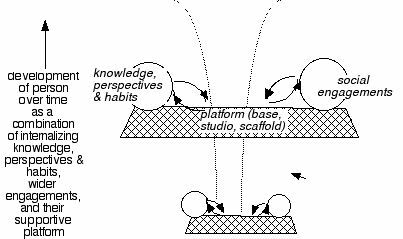 In the case of the platform, ‘secure base’ could mean to have not only ‘supportive stimuli’ in terms of knowledge, theories, practices and approaches but also the ability to comprehend (in terms of making connections, listening, observing, belonging, being meant etc.). When an artist/professional/practitioner thinks critically developing a “process-in-context”, first of all he/she thinks critically for himself/herself. The only think that could change perspective in terms of society (“context”) is the assumption that we are human beings connected each other. Our objective should be the human being within society (the human community, the “public good’), the “platform” could be filled out with different “manifestations” (or “processes”) of knowledge within, across and behind disciplines. These processes allow us to rich a more comprehensive knowledge of ourselves and our social engagement within the (“unruly”) complexity. Additionally, I do not know if the attempt to get by without the support of others would always mean something negative. In some specific moments of our development (as a self that develops) we do not need to be secure, we ask to be understood, comprehended, and included. We likely need to be free to decide, to make mistakes, to become anxious (it is the risk involved in the process of critical thinking). We surely need to be connected with others and to make connections, to debate with an ‘anxious’ (in this case, anxiety becomes a motivator) attachment to what we are going to do. We need to found a ‘democratic’ epistemology of action. I emphasize “processes-in-context” over ‘learning to live’ in part because of my masculinist bias = start with the self and add in relationships later, rather than start in relationships. Phelan and Garrison in Rethinking Reason highlight that distinction. However, that bias gets in the way of fully exploring what a platform/studio/base is. “are more likely to stick—to be remembered, become part of your own cognitive structures or physical capabilities, become part of your own thinking and habits—if practiced in a supportive space and then put into practice in the wider world where both kinds of practice are more likely if the they [the new knowledge, perspectives, practices] build on your pre-existing structures and capabilities—your ‘private universe. '” For the instructor, coach, mentor, or colleague, the qualification adds the challenge of bringing alternatives that you had not entertained into your consideration.